Mary Lennox, a spoiled, ill-tempered, and unhealthy child, comes to live with her reclusive uncle in Misselthwaite Manor after the death of her parents. There, she meets a hearty housekeeper and her spirited brother, a dour gardener, a cheerful robin, and her willful, hysterical, and sickly cousin, Master Colin. With the help of the robin, Mary finds the door to a secret garden, neglected and hidden for years. When she decides to restore the garden in secret, the story becomes a charming journey into the places of the heart, where faith restores health, flowers refresh the spirit, and the magic of the garden, coming to life anew, brings health to Colin - and to Mary, happiness. Public Domain (P)1992 Blackstone Audio, Inc. I'm in my 50s, but had never read this classic. (Saw the film and Broadway version). My usual taste is non-fiction or Ruth Rendell and other contemporary mysteries/thrillers. I LOVED IT! Beautifully written, full of insight into human nature and appropriate/inspiring for all ages. Go for it. Especially for a time when you need a good healthy dose of hope. Would you listen to The Secret Garden again? Why? It was fun to listen to someone else read this book. I have read it many times, but had never heard the correct "yorkshire" pronunciation. The "yorkshire" is important to the book, and my experience of this book was greatly enhanced by hearing it. Reading the book can be difficult (especially for a child) because of the dialect, listening to it made all the difference. There were so many narrators to choose from, so my 10 year old and I listened to sample after sample to narrow it down to this version. I know the story well, but the 10 year old had not read it. We could hardly stop listening. In this story skinny, cranky, unlovable Mary meets spoiled, sad Collin and through their relationship with each other, and a few down-to-earth friends, heal themselves by turning their attention outward to nature. I love how the children are able to help each other, instinctively figure out what is good and healthy, and keep such a wonderful and important secret safe until they can reveal it to those who are most precious to them. I love the scene in the secret garden when Collin stands up and walks and the gardener Ben cries. When they sang the Doxology I was very moved. On a whim I downloaded The Secret Garden for a road trip. I read it 20 years ago and loved the story, but like all things over time I had forgotten the context of the story. It was such a joy of re-discovery to go back to the Yorkshire Moors and the secret garden. The narration was superb which added to the magic of the classic story. I wish I had read this as a kid, but my school did not require much reading at all and that which was required was usually photocopied and stapled together. A sad affair, I know, however this book was wonderful, fun and made my laugh and feel great over and over again. I never read this as a child, but should have. To me, the true test of a children's story is whether it appeals across the generations. This one does. As much as it is another variation on an old theme (children, in their simpleness, being smarter than adults in helping others, such as Pollyanna), it is worth reading. The narration was adequate. Her children voices were not the best, but all others were terrific. Talking "in broad Yorkshire" was enchanting. This is a very endearing story and I would highly recommend it. A book for children and adults alike. I hated to see it end. Yes because it was a good story, simple yet not too simple, and very optimistic. Mary, she started off as a little brat, but became more and more loveable as the story progressed. Which character – as performed by Johanna Ward – was your favorite? None really, though she did a ok job with all the characters, I just didn't have a favorite. I did however like the general narration. But if I had to choose a character I would say Mary or Dickon. No, I seen the movie awhile back, so I kind of knew a little about it, and wasn't really suprised by anything, plus it doesn't really have any Oh dang.. moments. Though the book is a little different than the movie. Overall good story and well produced, the only very little complaint I have about it is the album art work for it. It came in a little fuzzy (I have the 4th generation Ipod), and it just annoyed me a little bit, but please don't let that stop you from getting this audiobook. I wouldn't use a credit on it though, since a credit cost more than the book, I just bought the book itself. If you love the book you're going to love this recording. Joanna Ward does an excellent job as narrator. She keeps you wanting to keep listening! If you could sum up The Secret Garden in three words, what would they be? Beautiful, thought provoking and comforting. This is one of my favourite books of all time and having it on audiobook forever makes it so much more accessible when I need to relax. Doing an English degree, one can get lost in the course content, but this is what I fall back on time and time again. It was one of the first books I read independently and therefore it will always mean something to me. It was beautifully read with the correct emotion for each character. What was one of the most memorable moments of The Secret Garden? I loved the moment when colin walks for the first time. As a person with a disability, I know how liberating this is. Having that read to me was very very comforting. I loved every minute of this and would recommend to everyone to read or listen to. Having never read this as a child it's been on my TBR for a while. Johanna Ward's narration is excellent. She really brings Mary in particular to life. Highly recommended. The final chapter when Archibald Craven has his 'awakening' travelling in Europe. The accents and tone of voice were right for the different characters. It certainly made me smile several times. I read this as a child. Listening to it as an adult (in my 40s) brought much of my first reading back to me. A joyful experience listening to it. I first saw the film years ago when I was a child. I loved it then, but I'd never read the book. I'm glad that I have, the film and the book (from what I remember if the film) follow closely with each other. I really enjoyed reading this and the audible version is great too. A real classic that I will be sure to read again. 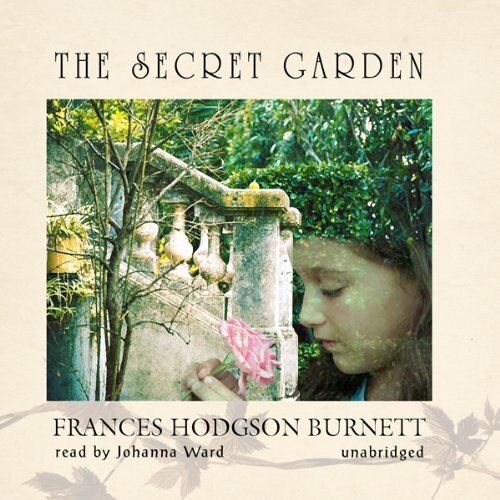 Would you consider the audio edition of The Secret Garden to be better than the print version? My son was reading this at school and did not understand it so we got the audio and the whole family listened and really enjoyed the story. I listened to this with my 9 year old daughter. Initially on a long car journey, but we didn't finish it in the car so we finished it over several bed-times. It was innocent, charming and the pictures painted so vividly by the beautiful writing. I would recommend this classic for children and adults to enjoy together. Beautiful book sometimes thought of as a childs story but definitely for all ages, magical.. Read well by Johanna ward. very nice yorkshire accent. the narrator was good, very enjoyeble to listen. like it much.